Arnott’s in Australia has launched “Truly, Madly, Tim Tam”, an integrated advertising campaign inspired by the imaginations of passionate Tim Tam fans. The first commercial in the campaign, Truly Madly Tim Tam, captures the joy and excitement of Australians as they discover the Truly, Madly Tim Tam Orchard. The orchard was created in Martin Place, Sydney, with over 100,000 Tim Tam biscuits, after fans on the Tim Tam Facebook page wished that Tim Tam biscuits would grow on trees. Tim Tam fans will also be able to add their name to the television commercial via a Facebook app that enables fans to personalise the advertisements, creating sharable content for social networks. 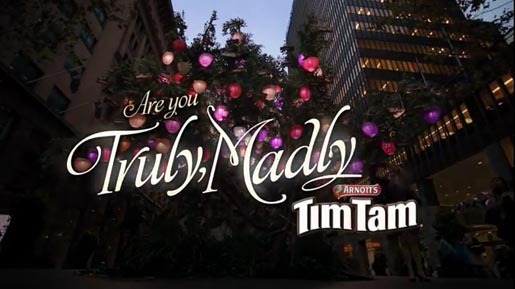 The Truly Madly Tim Tam campaign was developed at DDB Group Sydney, Mango and Tribal DDB by executive creative director Dylan Harrison, creative director Scott Huebscher, creative team Richard Apps, Andrew Allsop and Erica Valenti, craft designer Shane Wahl, managing partner Nicole Taylor, planning director David Chriswick, business director Dave Murphy, agency producer (TV) Samantha Meehan, project director Rebecca Jones, senior executive producer Brooke Pilton, senior community manager Hannah Cooper, head of publicity Tina Alldis, digital producers Jeroen Jedeloo and Raghav Mathur, technical director Ferdinand Haratua, digital team Robertus Johansyah, Mark Esther, Josh Kelly, Ivan Yip, working with Arnott’s Tim Tam marketing director Susan Massasso, group marketing manager Susanna Polycarpou, marketing manager Leigh Coleman and brand manager Holly McCarthy. Filming was shot by director Simon MacRae via Orange Whip Films with producer Alex Mooney, director of photography Judd Overton, production designer Jamie Morris. Editor was Stuart Morley. Post production was done at Fanatic Films. Music was composed by Blair Joscelyne at Nylon Studios. Media was handled by MEC Global.